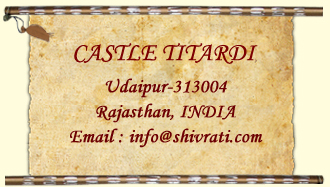 Welcome To Shivrati Sixth Century A.D. - Legacy & beyond, Udaipur Royal Family of Shivrati. Please do not hesitate to contact us any time with any questions or comments. Shivrati.com owns the intellectual property rights in relation here to, but as Shivrati.com is not a legal entity thus it shall not be responsible / liable for any acts / omissions / commissions by any of the institutions / corporates / trusts / organizations under / in relation. Shivrati.com is not responsible to address / resolve any issues arising out of the acts / omissions / commissions by any of the institutions / corporates / trusts / organizations under / related to Shivrati.com .